In a remote region of Nepal, at an altitude of 13,000 feet, a community ekes out an existence against a backdrop of breathtaking beauty. It’s a place most of us will never see, but we can catch a glimpse this month. 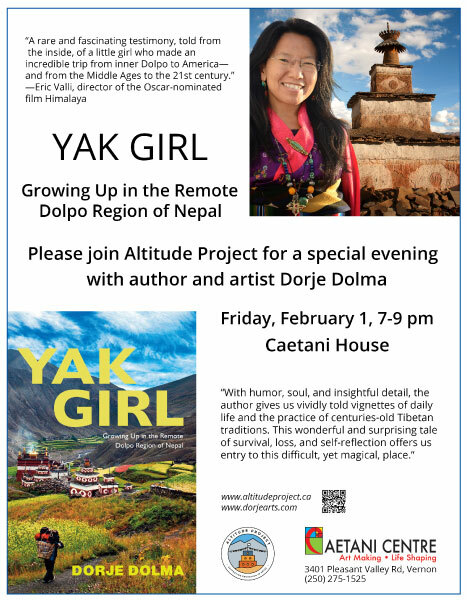 Author Dorje Dolma presents her book Yak Girl: Growing Up in the Remote Dolpo Region of Nepal at a special presentation on Friday, February 1 at 7:00 pm at Caetani Centre Studio Gallery in Vernon. The multimedia presentation is accompanied by portraits from the village by photographer David R. Gluns. Dorje’s Okanagan tour includes a second presentation at the Kelowna Public Library, Downtown Location, at 3:00 PM on Saturday, Feb 2. The tour also includes schools in Nelson, and presentations in Rossland, Castlegar and Nelson. On Monday, February 4, at 7:00 PM, the Civic Theatre in Nelson will show the documentary The Only Son, which follows Dorje’s brother Pema and his family, and the struggle to preserve a culture.